Let's take a look at the Kenmore Elite 4.0 cubic foot front-load washer model 4147X. This model is available in white (41472) and silver (41473). This washer replaces the previous generation Kenmore Elite 41022/41029 (white/red). Like previous Kenmore Elite front-loaders, the 4147X has extremely quiet operation because of its direct-drive motor, suspension system, and bearing rings around the front and back of the washbasket to offset load imbalances. It is also very energy efficient as well as water efficient, to save you money on your utilities. And, of course, it's gentle while cleaning your laundry thoroughly, including a Sanitize cycle and steam options for many cycles. Something must be different, right? Yes! What changes with this new generation front-load washer is two features. First, there's a three-port water system (one at the top, one at the lower left, and one at the lower right of the door opening). This system speeds up the process of soaking the laundry and distributing the detergent, which lets the detergent work on the laundry sooner. It also improves rinsing by using higher pressure and multiple directional sprays to rinse more thoroughly than traditional single-port systems. The second feature that changes is Accela-Wash, a combination of wash motions and the three-port water system that reduces wash cycle times by as much as 35%. On the Normal and Casual cycles, Accela-Wash is automatically used. On several other cycles, the Accela-Wash button can be pressed to help speed up cycles if you wish. 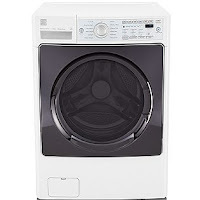 This washer has been extremely popular since its introduction due to price, features, and shorter wash times. Give it a look and see if you don't agree that it's a great washing machine!